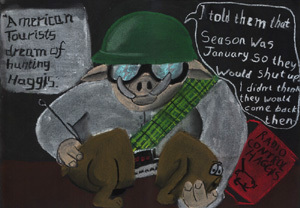 So, after a couple of weeks of intrusion from the real world Gregor returns This is actualy the first Gregor strip I drew and really marks the begining of the actual story line. Where it goes from here you will have to wait and see. Since I've been plugging my art auctions for the last few weeks I thought I'd plug something else for a change this week. 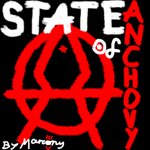 Don't forget official State of Anchovy T-shirts are still avaliabe. Enjoy The Anchovy.